The Ritter Sport brand turns 105 this year. But the brand is anything but outdated. Most recently the long-standing Swabian company has surprised us with exciting cooperations, social media campaigns and product innovations. 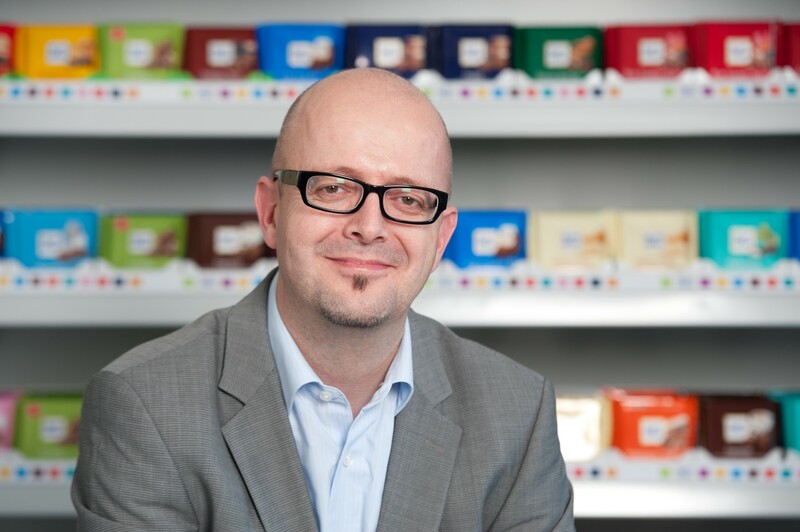 We asked Ritter Sport Marketing Director Jürgen Herrmann to explain the strategy and tell us what the company learned from the coup with their 2016 unicorn chocolate. Mr Herrmann, Ritter Sport is turning 105 years old this year. What’s the secret to the Ritter Sport marketing strategy which keeps your brand fresh after all these years? Relevance for the consumer plays an incredibly significant role. Which means you have to offer the consumer something they like and something which means something to them but is also contemporary. It is equally important to be unique and that the originality of the brand, its genetic code, is always maintained – also in your communication activities. A good example of this are our railway station billboards with their cheeky slogans. In Ritter Sport's marketing strategy, how do you create a meaningful balance between regular reinvention and adherence to traditional brand elements? If in doubt, it is far better to adhere to the brand’s core identity than initiate a forced reinvention if it just doesn’t fit to your core brand. An example: when thin and dark premium chocolate bars were quite the trend about ten years ago, we didn’t jump on board. Rather we made the pieces of our fine dark chocolate smaller (6x6 pieces instead of 4x4), but we kept the square shape and above all the thickness of the bars. This has been one of our most successful launches in the past five years. TV advertising has been part of the Ritter Sport marketing mix since 1970. How important are television ads for the brand? TV advertising is still incredibly important. Because of the number of people it can reach and how fast it is. TV is still the only medium that reaches 70 percent of the population within two weeks. Ritter Sport marketing occasionally also makes use of trends and current events in the social web and joins the movement (keyword: chocolate pizza, Midsommar, etc.). How important are social networks for your strategy? And why have you up until now avoided Snapchat? Social media is the media of dialogue. It is indispensable in today’s marketing and communication. Consumer ideas can be directly integrated. And these channels also provide us with the opportunity to reach younger target groups. As far as Snapchat is concerned, that may change. Support and time must be invested in every channel. If you can’t make that investment for social media, you shouldn’t get involved. What did you learn from the hype surrounding the unicorn chocolate? Two things. Unicorns are magical. And fairy tales are still alive and well. No, but in all seriousness, we saw what drives consumers. The trend has to be integrated in an authentic manner. Both timing and transparency play an important role. This is particularly important particularly when things also become difficult: when the unexpectedly huge run on our online shop made it crash, we clearly specified the reasons and difficulties for this. We sought to establish a dialogue with the consumers. In the end, the campaign was a huge success and we were able to bring joy to many people. It is simply not possible to plan some things in advance, but new areas can be developed using strategic guidelines and search fields. Success isn’t something you can leave to chance. In recent years Ritter Sport marketing has regularly hit the headlines with its interesting cooperations (VfB Stuttgart, Red Nose Day, etc.). How were these business relationships created? Different ways. Relevance is the focus here as well. The target group is the most important thing. It must consist of consumers who want what you offer. Ritter Sport’s flagship store in Berlin has been open since 2010. How important is this offline adventure world for the brand? Berlin’s colorful chocolate world is incredibly important and has been very well received by the consumers. Around one million people visit every year. The flagship store is an opportunity to experience the emotion of the brand. And the enjoyment of savoring chocolate is an offline experience. Ultimately, Ritter Sport chocolate is a product for the whole family. With this in mind, is there anything you need to watch out for in your communications? There are no defined target groups for the brand as a whole. Chocolate is for everyone. But for some our varieties, consumer groups can be approached in a targeted manner. For example, we know that men generally favor varieties that contain nuts while women often prefer fruity chocolates. As a global brand: is Ritter Sport marketing in Germany different to your other markets? Not at all as far as the tonality and content are concerned. We know that our brand and type of communication is well received by consumers around the world. We only make very minor adjustments when we implement our communication measures. The focus is always on the core brand identity! When did you first go international and how did the brand approach this? We took our first step in this direction 40 years ago in Italy and Denmark. The second step followed in early 2000. Globalization only makes sense when the brand is really accepted in the countries where the product is launched. What can we expect from Ritter Sport marketing in the future? Square, colorful, delicious, high-quality chocolate in many different varieties. Along with lots more likeable craziness, which has always been a part of the DNA of our medium-sized family enterprise. We are also making great strides towards our goal of harvesting 100 percent sustainably cultivated cocoa – just like our first harvest on El Cacao, our own sustainable plantation in Nicaragua.